After a successful robbery leaves famed theif Lupin III and his partner Jigen with nothing but a large amount of fake money, the so called "Goat Bills", he decides to track down the counterfeiter responsible - and steal any other treasures he may find in the Castle of Cagliostro, including the 'damsel in distress' - Clarisse, he finds imprisoned there. However, as usual, Inspector Zenigata is hot on his trail. The Castle of Cagliostro can safely be referred to as a classic in the anime genre. 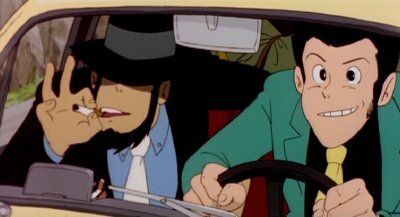 Originally released in 1979, it was the second film created for the Lupin III (Rupan Sansei) universe, which revolves around the exploits of Arsène Lupin III, a master thief. The Castle of Cagliostro moves at a breakneck pace, and it takes you on one fantastic ride. Lupin uses just as many gadgets as James Bond! The eponymous castle is as impenetrable as Fort Knox, with innumerable traps and dire security measures—but of course our intrepid hero can sneak in without breaking a sweat. To boot, Lupin must evade his nemesis Inspector Zenigata, a Japanese Interpol operative, as well as Fujiko, a female thief who is also after the vast fortune hidden in the castle. The count is a evil man who only wishes to marry Clarisse to join together the two families that split the castle's fortune many centuries in the past. The plot is rather zany from start to finish as Lupin tries all manner of tricks to rescue the princess Clarisse. 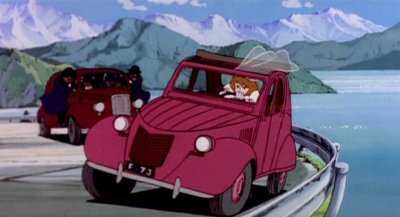 A lot of very inventive situations arise, including a nifty car chase involving Lupin's gravity-defying auto, a spectacular escape from the Cagliostro castle in an autogyro, and a clever finale within the gearworks of a clock tower. Lupin always has a trick up his sleeve for virtually every situation that arises. It's a blast just watching what zany stunt he'll pull next, and rest assured, he pulls plenty. While the story, characters and situations are wholly eccentric, the theme itself is a simple tale of a heroic knight rescuing a damsel in distress. While the damsel in distress part is completely believable on the part of Clarisse, it's not often an international thief is cast for the role of the heroic knight. Of course, Lupin is just charming in every conceivable way, and fits perfectly in the heroic role into which he's thrust. The background art is nothing short of excellent, and the animation, while lacking in detail, is quite fluid. Manga's re-mastering of this classic certainly enhanced the visuals compared to the old Streamline release. The new Manga dub is pretty good, as well. While I thought the original Streamline dub was pretty good for its time, Manga managed to capture the same feel, while providing a more accurate translation. Overall I recommend this film to anyone who is after a good old fashion adventure movie. At 100 minutes the film never slows and everyone should track down a copy of this dvd, especially as you can pick it up for around £7.99. The extra's are very slim, but when the movie is this good I don't mind.